Question: What is progressive ply failure analysis (PFA)? Answer: PFA is a type of analysis used to model the failure of a composite laminate on a layer by layer basis. From Andrew Main's Use of Finite Element Analysis to Create Robust Composite Designs – Going Beyond First Ply Failure. 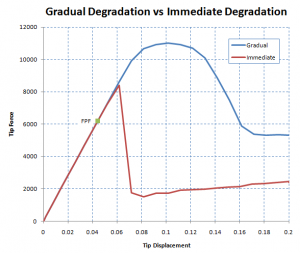 This analysis approach allows the structure to degrade after first ply failure, but continue to take load until there is an ultimate failure. The method reduces the local ply stiffness at the failure location by a factor of, for example, 100. This is effectively “switching off” the ply on that element. We can use our standard polynomial failure theories and even augment these with advanced failure modes for micro-mechanical failure such as fibre buckling and relative rotation between plies. There are also controls which govern how the ply stiffness is reduced. We can introduce a failure where the failed ply reduces its modulus in a gradual rather than instant way. 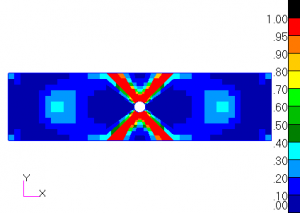 This can be used to simulate materials which do not have a brittle failure. The following figures show the analysis of a tension specimen with a hole. Figure 2 is a plot of element damage at the ultimate failure. Figure 3 is the load-deflection behaviour for the same specimen. 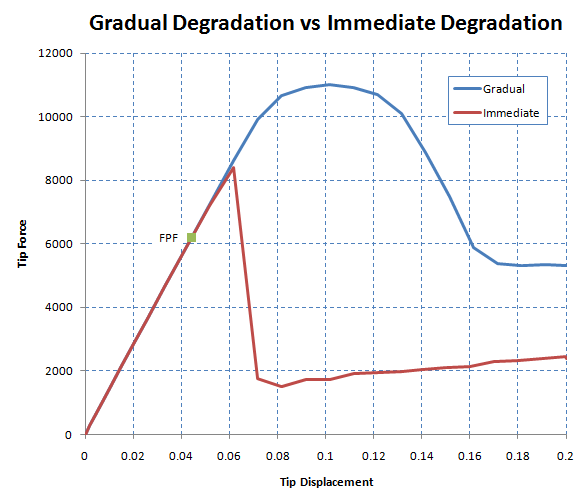 This figure has 2 curves, the red one shows the behaviour with immediate “brittle” degradation and the blue one shows gradual degradation. As can be seen there is a big difference here which we need to understand when doing our analysis. In reality the behaviour is due to the nature of the fibre failure. The analyst needs to know this from material testing. Also note in Figure 3 that the first ply failure occurs at around 6000 but the structure still has a very similar stiffness up to 8000. Even after the failure we see a residual load capability of around 25% of the peak. This can be seen in real life testing. Watch a webinar on PFA.